Newsweek's second annual ranking of the top rabbis in the country has been posted to the Newsweek website. This year, the list is called "Top fifty influential rabbis in America" and the creators (media execs Michael Lynton, Gary Ginsberg, and Jay Sanderson) explain their point system (20 points for being "known," 10 points for communal leadership, and so on). They also have created a second listing of the top pulpit (congregational) rabbis in the country. I was thrilled to see my extremely talented classmate, Rabbi Rachel Nussbaum, make that list. She is the founder and rabbi of Kavana in Seattle. It is also wonderful to see that my colleague, Rabbi Sharon Brous, made both lists. She is the founding rabbi of Ikar in Los Angeles. Of course, Rabbi David Wolpe of Sinai Temple in LA was ranked the #1 pulpit rabbi in the country and deservingly so. Rabbi Jack Moline, a Conservative rabbi in Alexandria, Virginia, was listed at #3. I've always admired Jack and am happy that he was recognized by being ranked so high on the list. I first met Jack in 1999 when I spoke at his congregation, Agudas Achim, for a Seminary Shabbat. I recall a funny story Jack Moline told me about his first experience meeting President Bill Clinton. Jack visited the White House weekly to study Torah with his friend and congregant Rahm Emanuel (left), the Illinois Congressman. Emanuel, then senior advisor to President Clinton, had an office in the West Wing. Jack always went to the White House with Kosher corned beef sandwiches for Emanuel and him to enjoy. He was also always prepared to stand at a moment's notice and greet the President with the traditional Jewish blessing one says upon meeting a head of state. One day during a Moline-Emanuel chavruta session, the President walked into Rahm Emanuel's office to chat about a basketball game when Jack jumped up with a mouth full of corned beef trying to utter the blessing. That story came to mind the other day when I read an article about Rep. Rahm Emanuel in Newsweek magazine. The article theorized that Emanuel ("Rahmbo") might be the most likely Democratic Party leader to be the one to encourage Hillary Clinton to drop out of the race should Barack Obama continue to be the front runner. Why Emanuel? Because, the article explains, he is close to the Clintons from his years campaining for them and serving in the Clinton White House. And he is close to the Obama campaign as well based on his long standing friendship with Obama's campaign strategist, David Axelrod. How close is Emanuel with Axelrod? "So close," Newsweek states, "that Axelrod signed the ketuba, a Jewish marriage contract, at Emanuel's wedding, an honor that usually goes to a best friend." So there you have it: Newsweek magazine... ranking rabbis and outing politicos as ketuba witnesses! 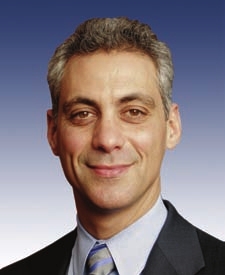 President Elect Barack Obama's first smart move in his transition to the White House is naming Rahm Emanuel as his Chief of Staff. Here is the Jerusalem Post article.